No two Hotel Indigos around the world are alike. 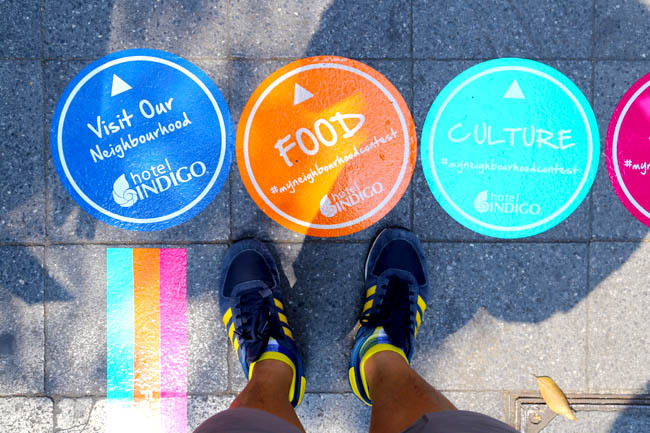 Each Hotel Indigo is designed to reflect its immediate surrounding local neighbourhood. That is what makes Hotel Indigo Bangkok Wireless Road unique, and that is why I like it a lot. A lot. Because I already love Bangkok. Hotel Indigo Bangkok Wireless Road’s restaurant Metro on Wireless is also a reflection of the local neighbourhood in terms of design, food, and philosophy. It is an understatement that food is a very important part of my life. 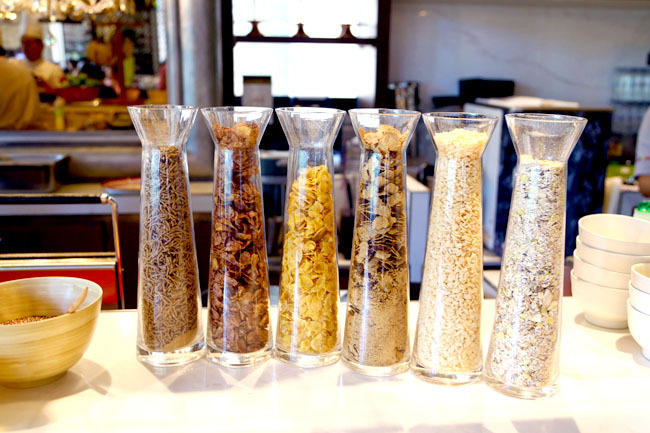 Therefore, a hotel’s restaurant and food quality are important factors I consider when I make my travel accommodation choices. 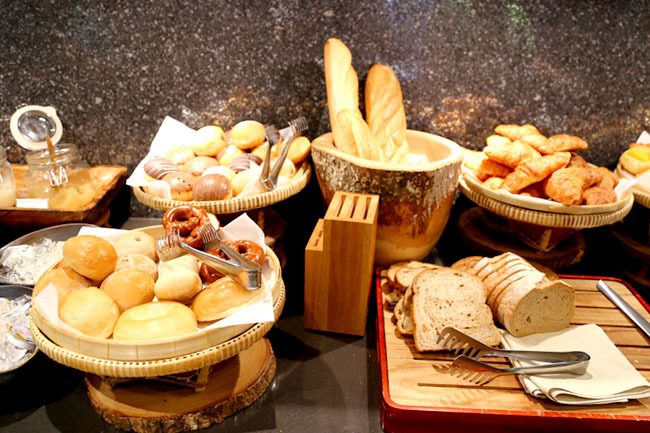 I am one who believes that any hotel stay is not complete without a good breakfast. Starting with the design, there is a sense of cosiness the moment you walk into the restaurant. 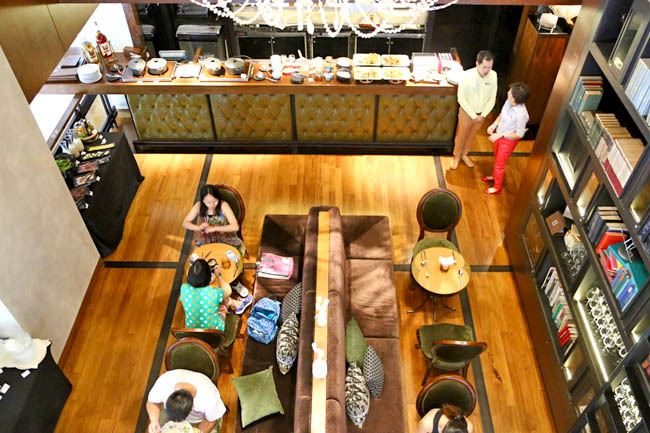 Tall ceilings, comfortable sofa seats, and decorations made of wood and rattan. Seats were placed far enough apart, and there is no sense of being cramped despite the restaurant traffic being brisk during breakfast. There is also a Mezzanine floor, complete with dark classic wooden furniture, long sofas and tall book shelves. Seriously, this looks like a stylish rich man’s house. 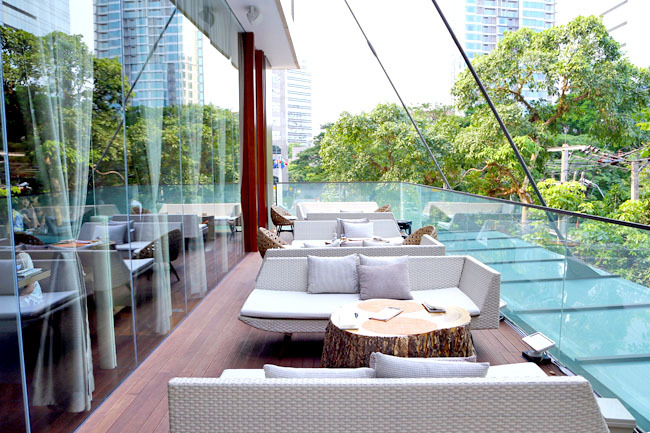 In the evenings, the Mezzanine serves as 22 Steps, a relaxing lounge and bar just 22 steps above the lobby, serving up a selection of cocktails, whiskeys and some of Thailand’s famous mocktails. I preferred to sit outside. The seats reminded me of deck chairs by the pool. Its tree log tables an expression of the iconic Lumpini Park (my guess) just minutes’ stroll away, matched with a view of the Wireless Road area. 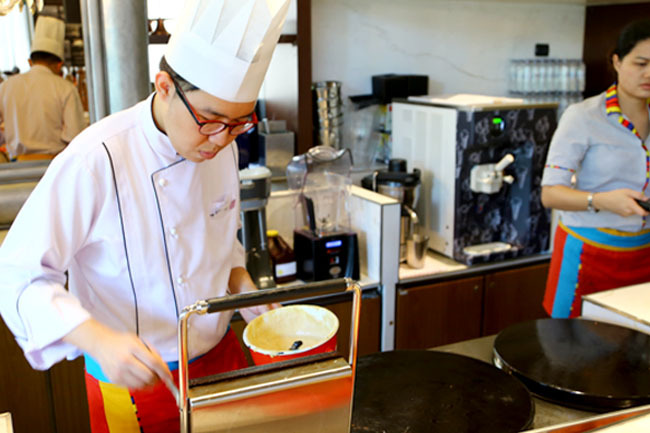 Food wise, you can pick an ala carte order of savoury AND a sweet item (Eggs & Waffles please), plus enjoy the cereal bar, cooked food, breads, fruits and drinks. Ingredients are locally sourced after partnership with local suppliers. The concept draws parallel from home. A child waits for waffles that mum is cooking, and in the meantime grabs some cereal, milk and juice from the fridge to nibble and sip. I did notice that the juices are kept in bottles within a fridge, next to the bread selections. Ah, such attention to detail. 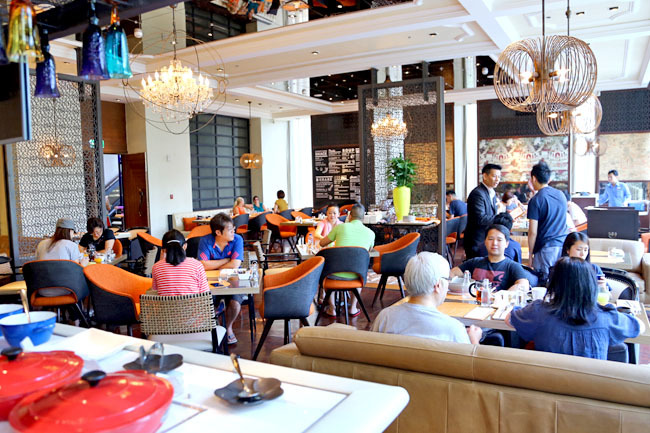 Metro on Wireless serves a selection of delectable Thai and Western cuisines, with authentic recipes inspired by the local community, conceptualised by chef Chamlong “Jimmy” Pewthaisong, the former head chef of Banyan Tree’s Celadon. 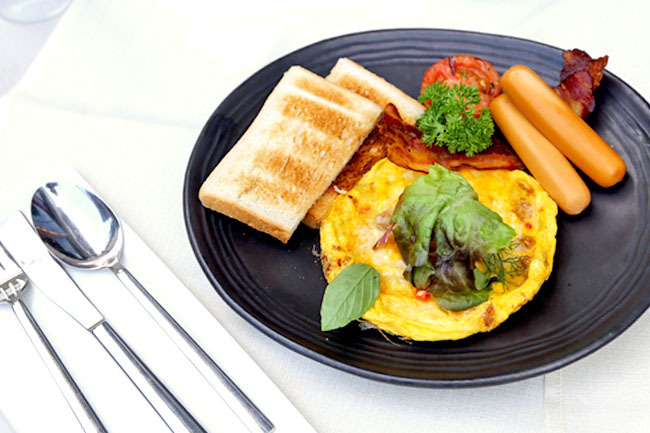 The Western dishes include Western Breakfast of fried eggs served in a pan, Spanish Omelette or just about Eggs of any style – boiled, scrambled, fried, poached or omelette. Thai style items included Thai Breakfast of boiled rice soup with pork or chicken, Pork Noodle Soup or Kai Jiew – Wok-Fried Thai Omelette wrapped around steamed rice. 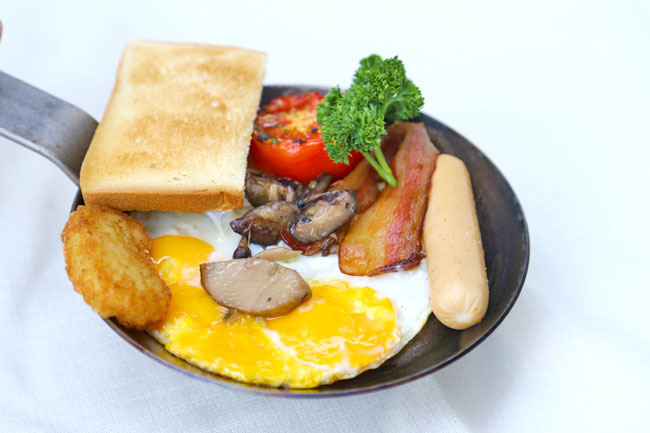 Western Breakfast – Fried eggs, sausage, bacon, hash brown, tomato, mushroom and toast. Spanish Omelette – Pan fried pork sausages, potatoes, onion, tomato, eggs, mixed herb, parmesan. 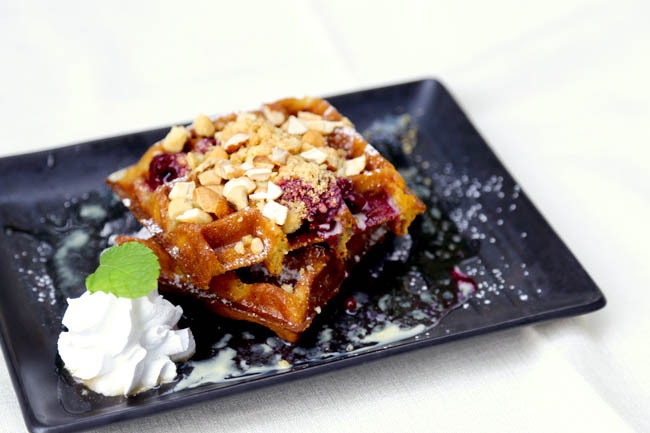 Waffles with berry compote, toasted nuts, vanilla sauce and whipped cream. 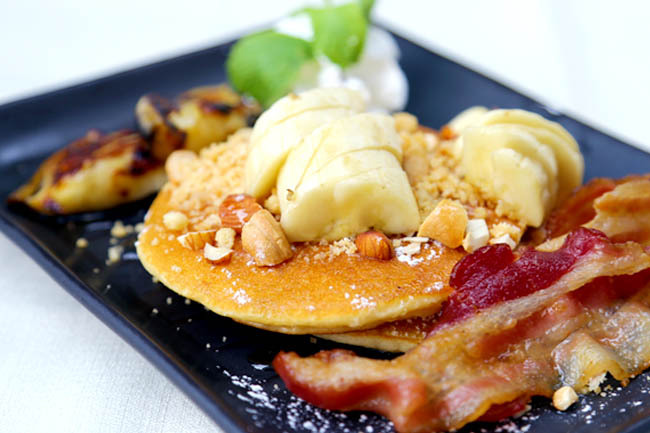 Pancakes with crispy bacon, banana, toasted nuts, and maple syrup. 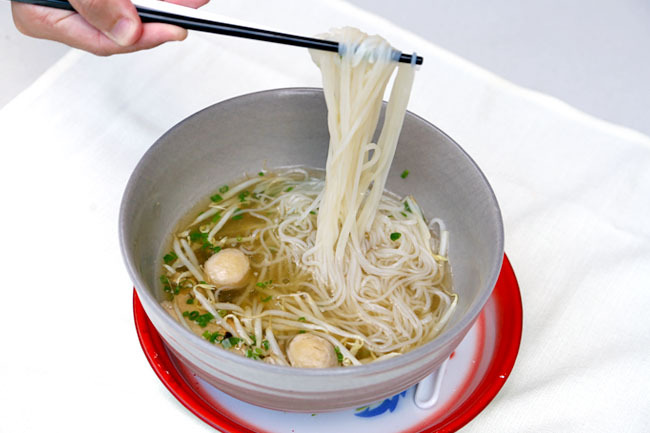 Pork Noodle Soup – Rice noodle with pork ball and bean sprouts cooked in pork broth. Kai Jiew – Wok-fried Thai style omelette, steamed rice and chilli sauce. My recommendation, especially if you are not so familiar with Thai food yet, would be the Kai Jiew. 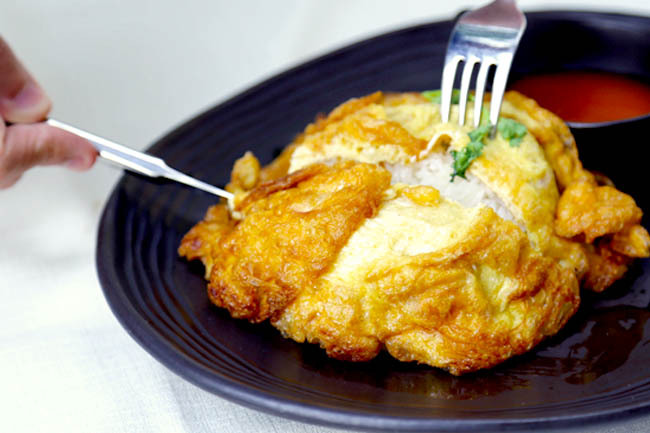 Compared to Western style eggs, this rendition of Kai Jiew is served filled with rice inside. Dip the fluffy egg into a Thai Siracha style Chilli sauce. It is only moderately spicy, and happens to be satisfying. The weather happened to be breezy, and sipping a cup of tea while indulging in waffles, watching the world go by, could be one of the best ways to unwind. 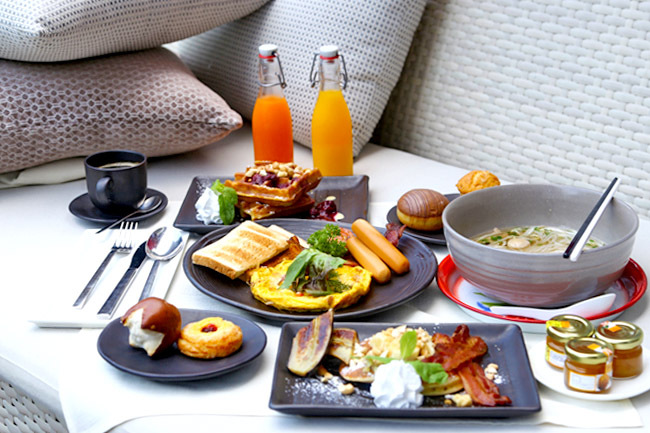 * This post is brought to you in partnership with Hotel Indigo Bangkok Wireless Road.